First match of the new season saw a great turnout with 20 anglers gracing the shore at Kelling, welcome to our new members, Colin Clifford, Simon Bottomley, Eddie Bowie and Peter Simmonds. We all knew that tonight would be tough with calm conditions and clear water, so it was decided to fish to 18cm and also as with international matches allow mackerel t be caught on bait and pop ups only , with a maximum of 3 allowed. There is not a lot to say… about the outcome of the match as the fishing was dire with 16 out of the 20 blanking, but it was a nice evening with some great banter and a chance to dust off the cobwebs of the last two months. Top rod went to Neil Haynes who managed two eels in the gutter and one mackerel, for 1lb 13oz , 2nd place went to Leon Smith with one fish for 9 1/3oz, 3rd place went to Colin Clifford on his debut match also finding a mackerel for 7 1/3oz and the only other to catch was Barry Iseton in 4th with a solitary dab for 6oz. Heaviest and only flatfish was Barry’s Dab and heaviest round fish went to Neil Haynes with a 37cm mackerel. 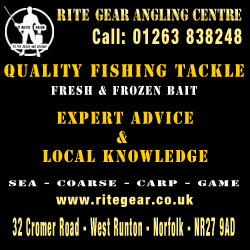 Next weeks match is at Cart Gap, Beach Rd, Happisburgh NR12 0PP, if unsure where it is please meet at shop fr 5pm. Please order your bait and book in as early as possible, if you can collect your bait from shop this will help me a lot but if you can’t let me know i will bring with as usual.